The 33rd Trans. 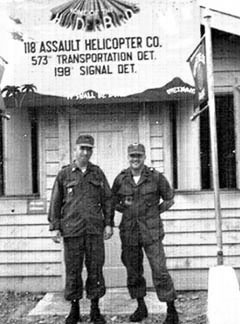 Company and the 118th existed in Vietnam for 9 years! That is a very long time for a unit to function in a combat zone. During those years many, many career U.S. Army personnel served in leadership positions. While they were only as successful as the people who followed their leadership in the unit, they were a strong influence on the performance of the unit as a whole. Our purpose here is to recreate a full listing of those who served as leaders, from start to finish, in the U.S. Army's finest helicopter unit to serve in Vietnam. 1SGT(SFC) James V. Tipton, Jr.
speaking at Change of Command ceremony on 21 Oct 64. 1SGT Lawrence C. Tyson (L) and CPT Lionel C. Waugh, XO in the orderly room of 118th. 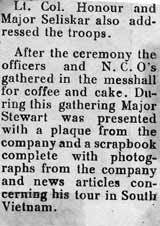 MAJ. George Owens who served as XO and CO of the 118th remembers, "I served with a number of units in my career, and commanded 5. My first command was a Rifle company in Korea almost 50 years ago. In my almost 23 years in uniform no unit I served with, or observed, could measure up to the 118th Thunderbirds. I don't know whether the 118th was just lucky to have such outstanding personnel assigned, or the unit itself brought out the best in everyone. Probably a little of both. I was never so fortunate as when I was in the 118th. Ted Jambon once told me that a smart CO surrounded himself with smart people and just let them demonstrate their intelligence and leadership abilities. Looking back, that was exactly how I handled the 118th. As the XO I had time to observe the people and their truly outstanding abilities. By the time I was fortunate to become CO, I knew enough not to micro- manage. 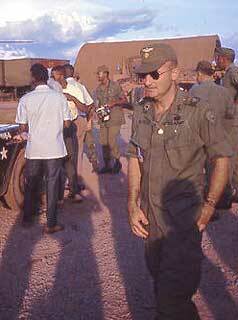 Thus, I was the luckiest CO in Vietnam." " The account is accurate with the singular exception that there were only two of us. CWO Warren (Pappy) Spencer and I decided to undertake the mission while returning from a sendoff for Maj. Bradner and CWO Bobby Bell at the O Club at Camp Alpha. As I recall, it was around 5:00 am in the morning and Pappy and I were still a little under the weather. I had the Bandit platoon sergeant, SGT. Jimmy Pirtle, strip down two Charlie models and Pappy and I flew the mission as a crew of one on each aircraft." Bailey Compound, Bien Hoa Air base in late 1968. If you know who served in a position of leadership when you were in the unit and they are not listed, or you see someone listed wrong, please e-mail the Webmaster , so the record can be set straight.